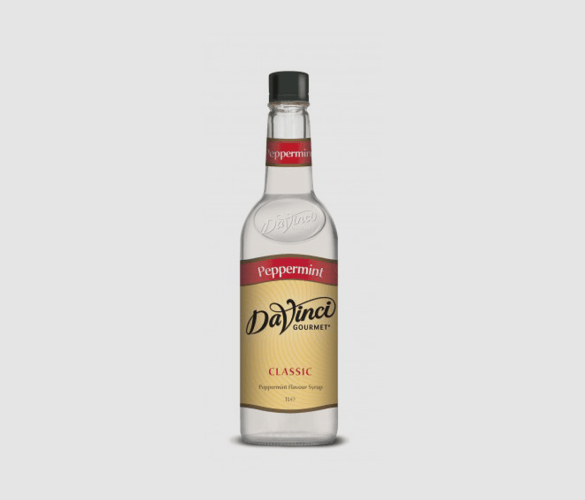 This DaVinci Gourmet Peppermint syrup will give you a cool breeze of refreshing minty flavour. Unique and delicious, have fun with creative recipes and experiment with flavour combinations. This is a true minty flavour due to the lack of artificial colours or flavours. This means that you can enjoy the full effects of this exhilarating peppermint flavour with no harmful chemicals. Enjoy in hot or cold drinks for an aromatic minty experience. Only made from the highest quality ingredients, you can rely on this product to deliver a premium taste every time. This syrup has been specially formulated to work perfectly when added to beverages. It resists curdling when mixed with dairy products and withstands well under heat, so this product will not let you down. One serving of this product goes a long way, so expand your menu and give your customers so many more options by simply adding this unique flavour. What Other Uses Does This Peppermint Syrup Have? Smoothies – Give your smoothies a cool edge with a splash of this syrup. Tea – Create your own delicious peppermint tea at home. Milkshakes – Stir it in or pour a little on top, both will be just as tasty. Hot Chocolate – Turn your normal drink into an exciting mint hot chocolate. Whipped Cream – Mix in to heavy whipping cream until soft peaks form. Desserts – Give your desserts a refreshing taste. Add to homemade recipes such as fudge, ice cream, brownies, chocolate cookies and much more. This fantastic recipe is a great way to recreate your favourite coffee shop drinks in the comfort of your own home. It is so easy and definitely a must-try. Mix together both syrups and the espresso in a mug. Froth your milk by shaking it vigorously in a cup with a lid and then microwaving for a few seconds to stabilise the foam. Add this milk to the mug. Top with whipped cream, a drizzle of syrup and whatever toppings you would like.